"This quick and delicious Swiss chard recipe can be served as a side dish or as a meal over rice." Chop the chard stems into 1/2-inch pieces. Stack the chard leaves, roll them tightly into a cylinder, and chop into 1/2-inch strips; chop the strips into halves. Heat about half the olive oil in a large non-stick skillet over medium heat. Cook chopped chard stems in hot oil until hot, about 1 minute. 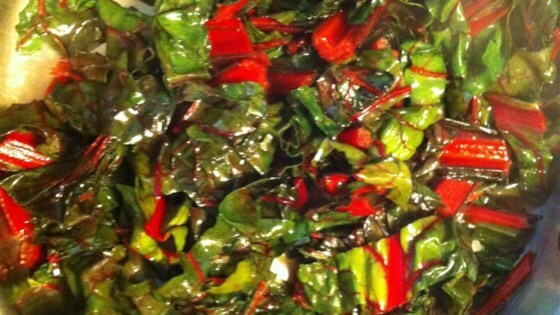 Stir the chard leaves with the stems; cook and stir together 1 minutes more. Drizzle remaining olive oil over the mixture and stir to coat. Continue cooking and stirring until the leaves are nearly wilted, 4 to 5 minutes. Remove from heat and immediately sprinkle kosher salt and squeeze lime half over the chard. Stir to season evenly. A little bland. I still like lemon better with chard. Would make again with some garlic, onion, and lemon with the lime. Delicious! We cook with 1/4 cup chicken broth and then drizzlew on the oil, but soooo yummy! Delicious. A great way to use fresh greens at its peak . I also added 1/2 tsp minced garlic and a bit of onion. The lime really does add some zing! i made this first with a small vegetable broth then added a bit of olive oil and topped it with the lime juice and salt. i would def make it again esp with all the chard i get from my CSA share. Nice cure for cabin fever-fresh greens and one's favorite seed catalog. I didn't add a thing to the recipe. The lime, salt, and oil are plenty. I’d use a little less water for a thicker soup, maybe 6 cups instead of 8. I only had 2 leeks so I added regular white onion as well.